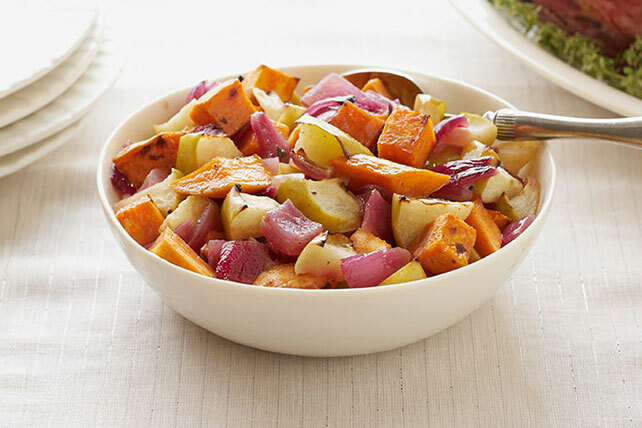 Add a little tart and savory to your sweet potato side dish by inviting roasted Granny Smith apples and red onions to the party. Combine first 5 ingredients; spread onto bottom of 15x10x1-inch pan sprayed with cooking spray. Cover tightly with foil sprayed with cooking spray. Bake 20 min. ; turn potatoes. Add apples; spread to evenly cover bottom of pan. Bake, covered, 10 min. Stir potato mixture; bake, uncovered, 5 min. or until potatoes are tender and lightly browned. Discard sage leaves before serving. Prepare using another cooking apple, such as Golden Delicious or Royal Gala. Garnish with additional fresh sage leaves. If serving a crowd, prepare recipe as directed doubling all ingredients.